Pronounced "shin-goo". Xingu Black Beer is named after the Xingu River, in the Amazon Rainforest. 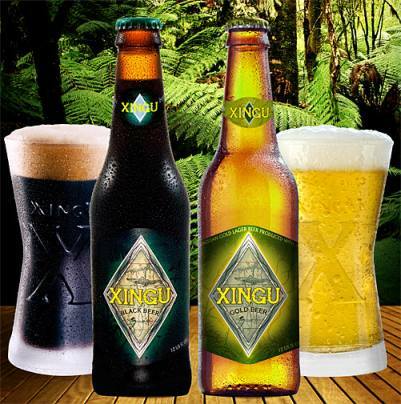 Inspired on old recipes of Indian beer, Xingu Black Beer is a two-time winner of Beverage Tasting Institute's Gold Medal for best dark lager in the world. This exceptional beer is a great success in Brazil and in the USA, and consumers are now having a chance to drink it in Australia and England. Xingu Gold is a unique beer in its flavor and body. Exotic and full of personality, yet very drinkable and pleasant. Xingu gold is brewed with a combination of Cascade, Summit and the New Zealand Nelson Sauvin hops for a distinctive floral aroma and drinkability.